We delighted in the wonderful Middle Eastern textures, flavours and spices that somehow we had not found in Dubai the previous week. It was an all-new experience. If you are ever in London and want a really special new eating experience, put this on your list. 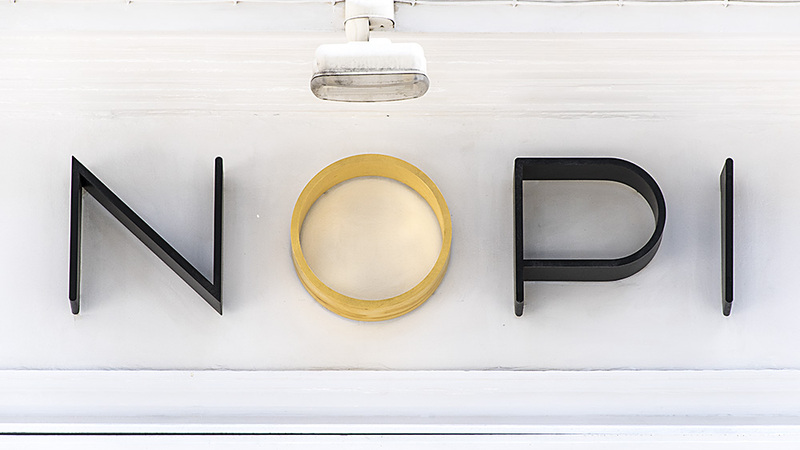 NOPI is five minutes walk from Piccadilly Tube Station. Bookings essential. This is no ordinary restaurant. Many of Ottolenghi’s recipes and ideas can be seen in his TV shows and in his book. Discovering the food directly and served as he intends, however, is sensational, literally. After a wonderful meal, we went our separate ways; me to amble through some of my old seventies London haunts; my wife on a serious shopping mission! 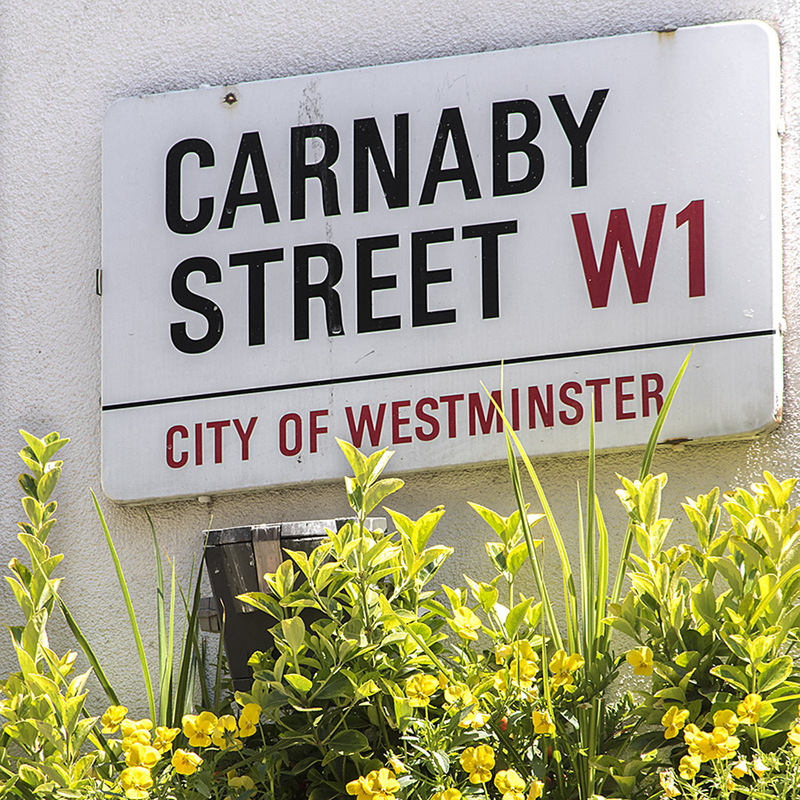 Walking up Warwick Street, one turns the corner, surrounded by little boutiques that owe their heritage to Mary Quant, John Stephen and Twiggy – the fashion Gods and Goddesses of London’s Swinging Sixties. Suddenly one is in Carnaby Street! It’s much more up-market than I recall. People are more smartly dressed. The little eateries all around are packed with office workers and busy negotiators enjoying spring sunshine. Eating outside was not a common occurrence fifty years go in London. One venue especially appealed: Shampers. As someone who has gone through the trials of comparing different styles and flavours of the world’s greatest sparkling wine, Champagne, I suspect they get a fair number of happy customers. It’s a quick five minutes until one arrives at Ramillies Street, just south of the bustling Oxford Street shopping metropolis. 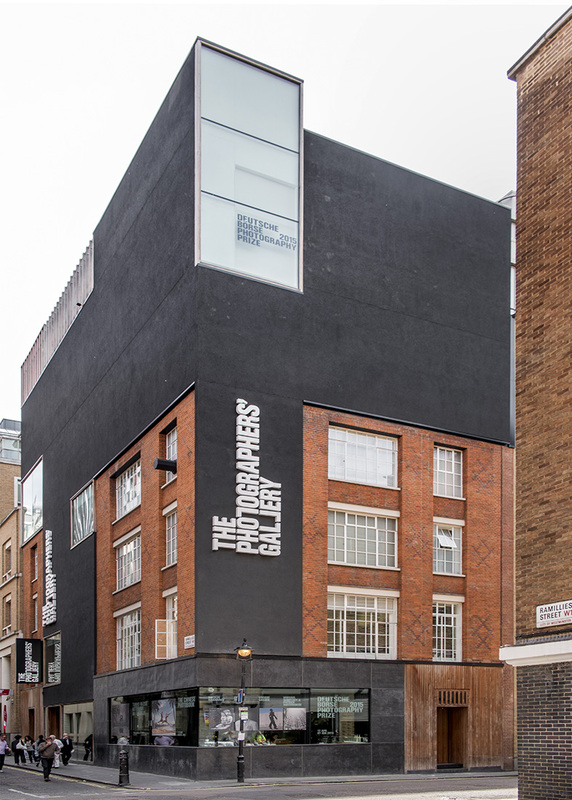 And there it is: The relatively recent home of the Photographer’s Gallery, moved a few years back from it’s much more down-market two building location near Leicester Square Station. From the outside strident black tones encompass the restored warehouse building. 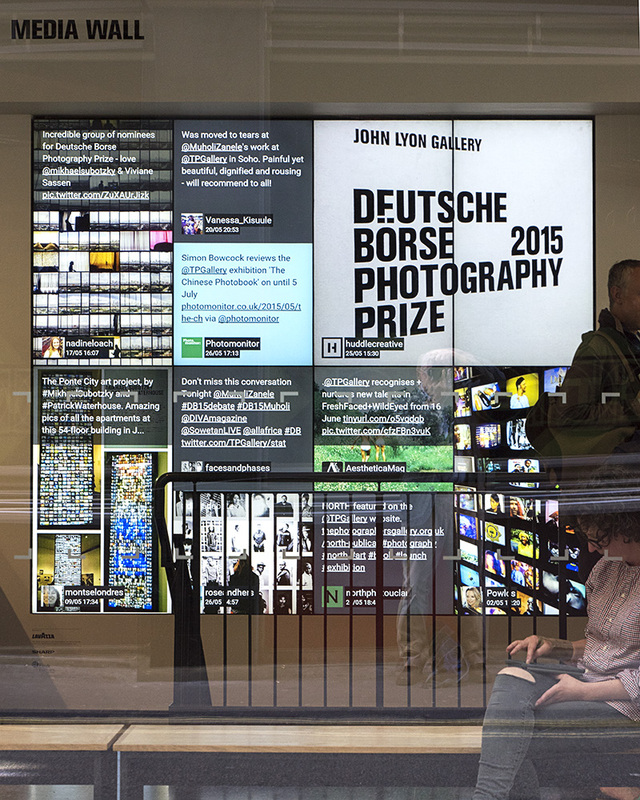 Inside, through the large plate glass windows eight large LCD displays advertise various events, exhibitions, upcoming courses and this year’s Deutsche Börse 2015 Photography Prize Finalists. As I enter and turn left to tackle the stairs of this five-level building, I am struck by the massive number of identified patrons, sponsors, funders and partnerships. Britain certainly has created a constructive philanthropy environment to enable a building and institution like this to endure for what is now forty years. As luck would have it my visit was one day prior to the announcement of the overall winner. The finalists have been on display for several weeks. The winners, announced this evening in London, were South African photographer Mikhael Subotzky and British artist Patrick Waterhouse. This was for their photo-documentary of the decline of the Johannesburg skyscraper Ponte City building, recording all aspects of the remaining residents’ lives in an amazing series of collages that left a deep impression of the decline of urban living, as gangs gradually terrorised people out of the building. These two photographers had in 2011 already taken out the Discovery Award in the Rencontres d’Arles for this remarkable three-year project. The story of the building and the decay of a once-pristine apartheid-era neighbourhood of Hillbrow, is extraordinary, as is the work of this meticulous team of documentary image makers. A more detailed report on other Finalists on show, as well as the competition history, can be found on Time Magazine’s Lightbox site here, where there is also a series of tributes today to record the passing of American Photographer Mary Ellen Mark. The other exhibition that gained my interest was a fascinating record of the Chinese Phonebook since 1900. The books displayed covered some of the most traumatic and dramatic periods of change in China’s 20th and early 21st Century history. The books inform on artists’ work seldom seen in the West, as well as outsiders looking in. Apart from learning much about the different visual styles used by Chinese photographers and occupying forces from Japan, or propagandists of the Mao Tse Tung and later the Deng Zao Ping eras, we also see work by foreign visitors, writers and photographers, some of whom record early 20th century Chinese almost as exhibits. Extraordinary for possibly the oldest civilisation in the world! The Photographers’ Gallery has an excellent description of the work shown on its website, which I commend to those keen to better understand how publications and the shift to a more public voice under Deng has brought China into a more widely accessible era, even for those unable to visit. Having had the privilege of seeing contemporary amateur photography exhibited at shows in Beijing and Shanghai over the past five years, as well as talking to local writers and photographers, I can attest to the wonderfully acute attention to detail and quality, perhaps bred from a set of disciplines and patience not seen so much in Western work in recent decades. One aspect of the exhibit itself I found especially appealing was the use of LCD screens to display hands turning over the pages of books that could not be opened for such public consumption in a conventional form. As a result, multiple page views became possible of the rarest volumes. A special treat. I left the gallery after an inspiring 90-minutes. I was again confronted with packed pavements and thousands of pedestrians, intent on colliding with each other. Almost to a man or woman, they gazed down into their all-important cell-phones, busily texting, not concentrating on being present. All failing to engage with the very environment in which they were walking. The road more slowly passed, and observed, is so much more rewarding. Just as a greater appreciation of Middle Eastern food cultures was garnered through our lunch at NOPI earlier that day, spending worthwhile time learning, by looking, reading and seeing through the eyes of talented observers and recorders of two fast changing societies in South Africa and China was deeply enriching. 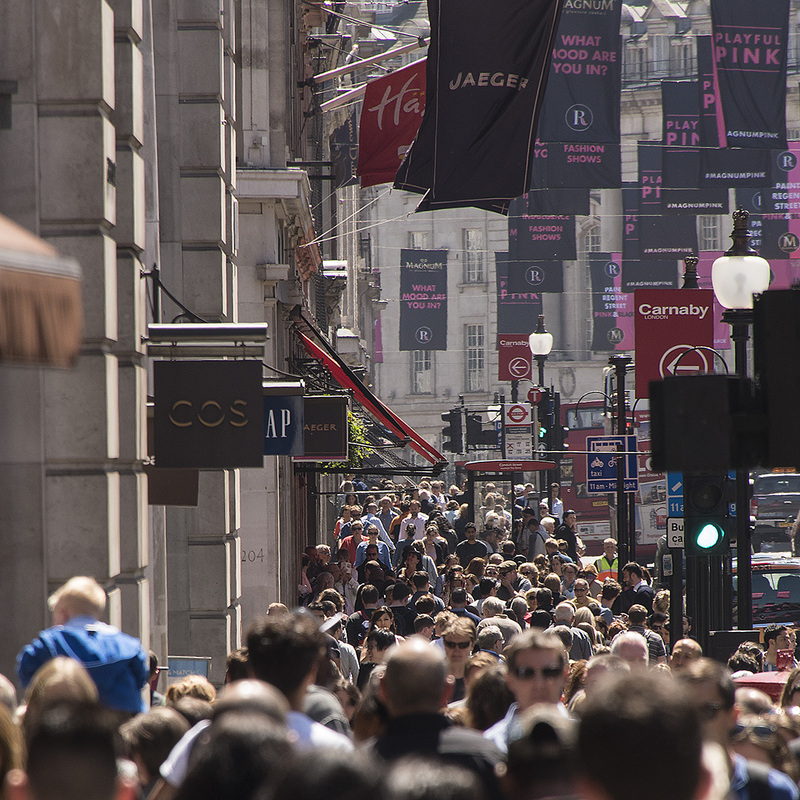 Some of these busy pedestrians will one day wake to the realisation that a virtual life is no substitute for a real one. With such a complex world, seeing and experiencing, and reflecting, is the beginning of understanding.